If you’re a reader in the USA or Canada, there’s not long to wait until the fourth book in the Wells & Wong Mysteries series is released where you live! 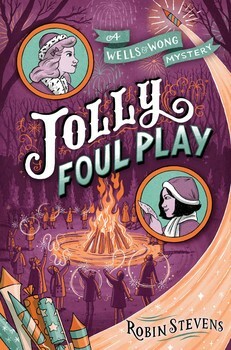 Jolly Foul Play has kept its title for its American edition, which I’m very pleased about. 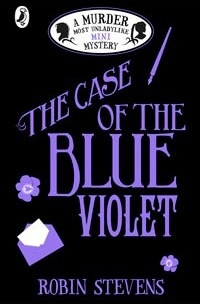 It’s publishing on April 17th from Simon and Schuster, and you can pre-order it from Amazon.com. It’s got another gorgeous cover from Elizabeth Baddeley – I love the way she illustrates Daisy and Hazel! 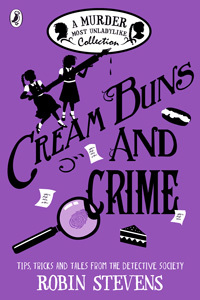 For the first time since the “Wells & Wong” series debut, sleuths Daisy and Hazel are back at Deepdean School with friends Beanie, Kitty, and Lavinia in 1935: their ninth-grade year. 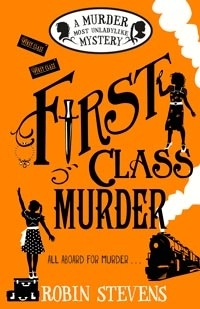 During the Guy Fawkes Day bonfire at school, the Detective Society encounters their newest case: Head Girl Elizabeth has been killed, and the only possible suspects are her five closest friends… As in prior installments in the series, Steven’s storytelling and suspense-building are top-notch… The fast-changing nature of friendship between girls is a constant theme throughout; the gossipy secrets Elizabeth uses to blackmail other students and Daisy’s insecurity when Hazel shows interest in a boy are prime examples. This realistic depiction of student life may make the 1935 setting a little more relatable for readers, while also providing appeal to an older audience than previous books. 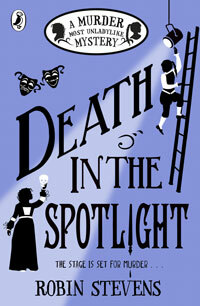 I’m really delighted – what a great review! 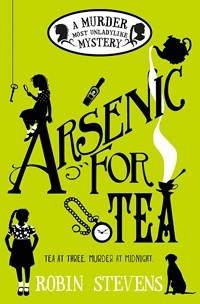 I love the cover and its illustrations! 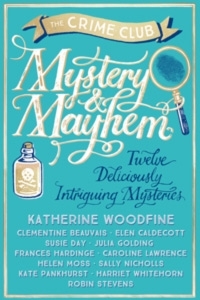 They’re by Elizabeth Baddeley – she’s the best! Wow, that’s an incredible review!!!!! Well done!!!! 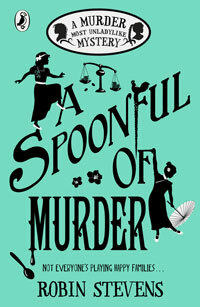 And a gorgeous cover! The cover is fabulous! And it’s amazing that Daisy and Hazel are travelling even further around the world! Amazing news! This may seem like a question that has come out of thin air: But will we be seeing Hazel and Daisy in a movie or even better a TV series. I think that would be awesome!! I so hope there will be, Ava – no news yet, but fingers crossed! My uncle is going to the US and Canada and I am going to get a US edition of MMU when he gets back! That is so cool, Zaynab, I hope he can find one! What an amazing review! And the cover illustration is beautiful. On Wednesday, I started reading Mistletoe and Murder again, maybe that is why it started snowing on Thursday? 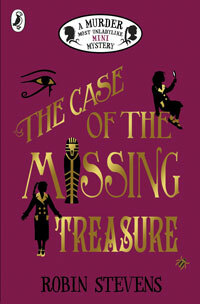 Also, on Wednesday I presented my The Guggenheim Mystery theatre programme, which had a front cover looking like the cover of the book, a blurb, a synopsis of the story, a cast list, a bit about you, a bit about The London Eye Mystery and The Guggenheim Mystery and a wordsearch I made all about The Guggenheim Mystery. I think people liked it 🙂 How do I show you a photo? Also, today is a snow day so we went sledging on sledge on the sledge my grandad made when my mum and uncle were children! Hi Colette, I would LOVE to see that programme! Please do email me it! 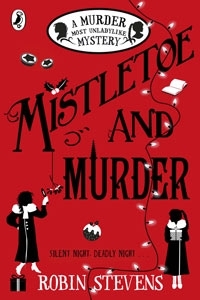 I’m really glad you enjoyed the snow … Mistletoe and Murder is the perfect companion! Ms. Stevens, it was so easy to give this book a positive review! 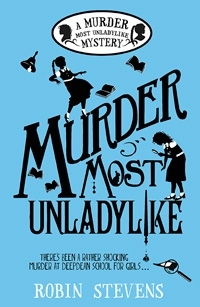 I had always seen your books at the library where I work (I am not responsible for collection development) and been interested in them as a fan of Golden Age mysteries, but given them a pass due to having so many other books to read. I was so excited when the galley of Jolly Foul Play landed in my mailbox as it gave me motivation to read the books that came before it! I loved reading all the Wells & Wong adventures and am sad it’s taking so long for the rest to come out over here! Can’t wait to read more about Hazel and Daisy. Gosh, thank you so much for commenting – and thank you again for a wonderful, thoughtful review. I’m a fellow Golden Age fan (of course) and I’m delighted that my books are reaching readers in the US. The next is out in the fall, so there isn’t long to wait. I hope you enjoy that one too!